5 Scenarios that Necessitate the Selling of Your Dividend Stocks | Wealthy Education - Investing Strategies That Work! Although our goal with long-term dividend investing is to hold our investments for as long as possible while they do all the work, there are a few situations that warrant our attention and may actually necessitate the selling of our stock. Most of these circumstances revolve around the state of the dividend. While it can be distracting, and even detrimental to constantly check stock prices and market news when you are a long-term investor, the one thing you should keep an eye on is the status and behavior of your dividends. The dividend serves as an indicator of the health of your investment. Regardless of external factors like a company’s earnings picture, or the fluctuating opinions of market analysts, the behavior of your dividends is the key to your investment kingdom. If a dividend is faltering, or doesn’t grow as it should, it’s likely time to abdicate the throne and sell your stock. Never forget that compounding is the foundation of a successful dividend strategy, and that time by itself is not enough to compensate for a lack of regular growth. Our strategy relies on specifically choosing stocks that we’ve calculated will provide us with both regular and increasing income over the long-term, and if a company fails or flounders in this regard, then they no longer serve a useful purpose in our compounding portfolio. It’s important that you remain impartial in your evaluation of a dividend’s performance, and that you never lose sight of the notion that investments are simply compounding vehicles. Sometimes investors become attached to the companies they’re invested in and are hesitant to let go of them, even when all signs indicate they should. It doesn’t matter if a company you own shares in is doing wonderful things like winning humanitarian awards, or building brand new offices, if its dividends are not living up to your original expectations, it’s time to cut that company loose and move on. How do you know when it’s time to pull the plug, and sell off one of your stocks? Simply put, when the dividend is in trouble. In this case, ‘trouble’ can be defined as when a dividend has been cut, or is failing to grow. There are four scenarios that warrant a closer look at the state of your dividends, and we’ll briefly examine each of these in turn. Many mature businesses have a company policy in place that dictates the percentage of earnings they pay out to investors as dividends. Should a company you’re invested in have such a policy, and should the company announce that they will be changing that policy to reflect a lower payout percentage going forward, it not only means that the current amount of your dividend payments will decrease, it’s also an indication that any future dividend increases are unlikely. This is not a desirable situation for a long-term compounding investment. You will recall that a modest dividend payout ratio of less than 60% is a good starting point for evaluating the sustainability of a company’s dividends in terms of its earnings. Mature and stable companies typically have a higher payout ratio than young or fast-growing companies, but when an established company’s payout ratio begins to rise, this event should be investigated closely. If that company’s revenues are also rising, or if there has been a one-time occurrence of a large expense or write-off that has caused the company’s reported earnings to be lower than usual, then there is probably not a cause for concern. If, however, the company’s payout ratio suddenly rises without cause, and its operational income is not increasing at the same time to serve as a support mechanism, the company will eventually be unable to afford to increase its dividends. In effect, this stock will no longer be capable of serving as a useful part of your compounding portfolio. If a company ever fails to raise its annual dividend, this should be viewed as a major warning sign, and you will need to discover and evaluate the reason behind it. As we know, some companies pay out less in dividends so that they will have access to more funds for business growth activities. If the company you’re invested in is in the midst of a significant capital expansion and needs to divert some of its earnings for this purpose, then that is generally an acceptable reason for temporarily delaying the increase of its dividend payments. Just the same, it’s probably not wise to hold onto a stock for longer than two years if dividend increases have ceased. And if regular dividend increases have suddenly stopped altogether without any explanation at all, it’s a good time to consider selling your shares and replacing them with an investment that better serves your compounding needs. At the opposite end of the spectrum from a dividend that isn’t increasing, is one that has actually been cut. This is the worst possible scenario for an investment that’s part of a compounding strategy. 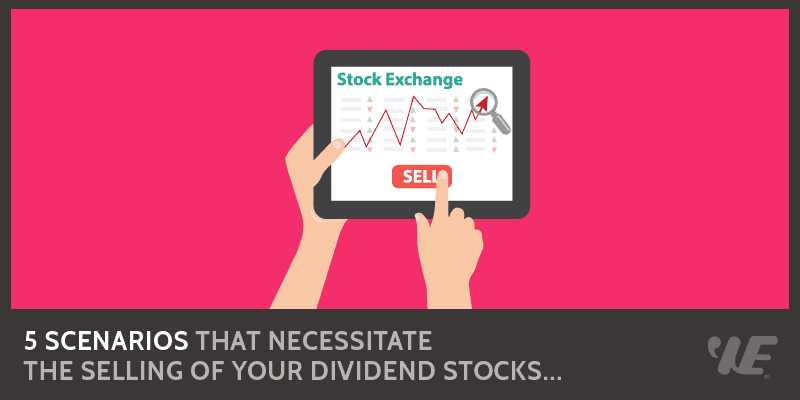 Not only does a decreased dividend negatively affect the income potential of your stock, it also virtually guarantees that the stock’s price will drop as well. Ideally, you should never really find yourself in a situation where your stock dividends are cut unexpectedly, so long as you have been watching for such tell-tale signs as rising dividend payout ratios, and decreasing company earnings and revenues. But in the event that you are caught off-guard, the best course of action is to cut your losses by selling your stock, and moving on. Unless any of your stocks display dividend behaviors such as these, you should continue to hold your investments in keeping with our ‘buy and hold’ strategy. Remember that emotional reactions to changing market conditions lead to rash decisions. The fewer decisions you make, the less chance there is that you will make the wrong one. Even the discovery of a new dividend stock with excellent potential for long-term returns should be viewed with caution, if it requires the sale of some of your current holdings to fund its purchase. Maintaining an objective, rational and ultimately passive view of your dividend stocks is the key to your long-term investment success. There is one final situation that is worth mentioning in regard to a possible decision to sell your holdings, and that is when the price of one of your stocks suddenly jumps significantly. This can sometimes happen when breaking news about a company, such as a potential takeover in the works, is viewed by investors as a huge positive in terms of future value. Knowing whether or not to take advantage of this situation by selling at a profit and reinvesting elsewhere can be a tricky business. While many stocks’ prices will eventually return to ‘normal’ after a sudden, news-based spike, some will not because the perceived added value becomes a more-or-less permanent part of their price. Sometimes, in a case such as this, investors will elect to sell just a part of their stock as a way of hedging their bets on both counts. The mentioned scenarios warrant a closer look at your dividend paying stock and sometimes they may necessitate the selling of your stock. As a conservative investor, it’s worth taking the time to frequently monitor your stock’s performance and take appropriate action when needed.